A tropical disturbance in the open Atlantic is looking more impressive. It is over 1500 miles east south east of the Windwards. Deep convection has expanded markedly. If you read our Atlantic summary you may be baffled by our "moderate" listing for development chances. It appears that this low is embedded in the ITCZ. Lows almost never develop in the ITCZ in the Atlantic. The rest of the world yes, but not the Atlantic. NHC labels nearly everything as a "tropical wave", but this low again appears to be more associated with the monsoon trough. The convection is still impressive, so if it continues to organize we'll also go with high chance of development later today. Forecast models take this disturbance near or northeast of the Leewards in a little less than four days. Interests in the eastern and northern Caribbean should follow this disturbance. 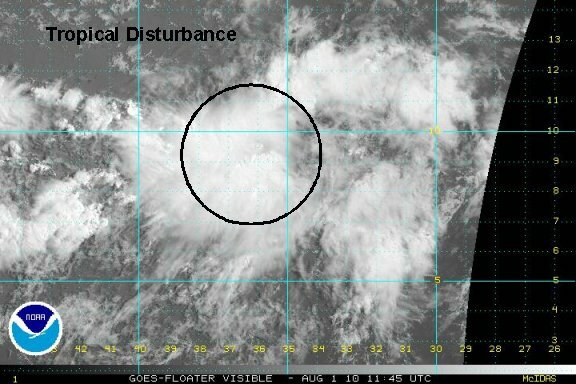 The tropical disturbance has gained a little organization today. It is still far from land situated about 1700 miles east southeast of the Windward Islands. Upper air conditions are favorable for additional strengthening. 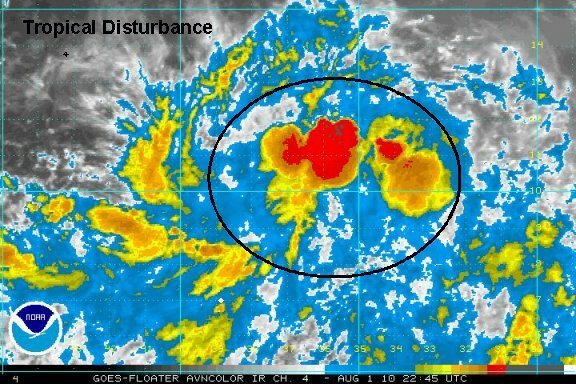 The Quickscat satellite would have been a great asset to evaluate this tropical disturbance. Those who said that it would not impact tropical weather forecasting could not have used Quickscat as an operational tool. Forecast models take this disturbance northeast of the Leewards in a little less than four days and near the Southeast in about 9-10 days. Keep in mind that forecast track error increases with time....in other words the farther out the forecast, generally the less reliable it will be. Interests in the eastern Caribbean, Bahamas, and southeastern U.S. should follow this disturbance. 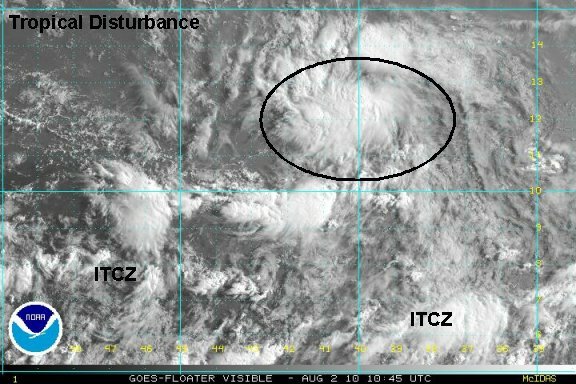 The tropical disturbance appears to be seperating from the ITCZ as another band of showers forms to its south. A circulation seems to be developing now. NHC mentioned several hours ago that a low level circulation was not seen on the ASCAT satellite. This has been the problem over the past several days - a broad low with a mid level circulation. 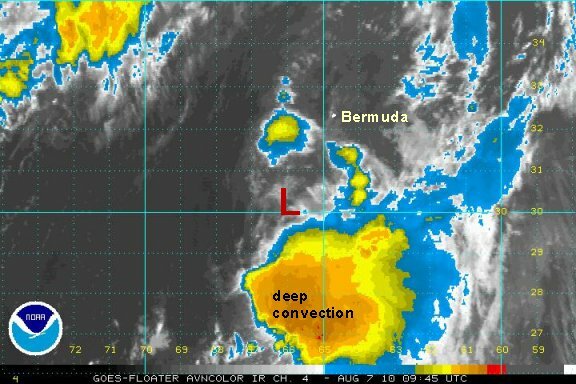 A ship report to the southeast of the broad circulation reported a westerly wind indicating that a low may now have actually developed. 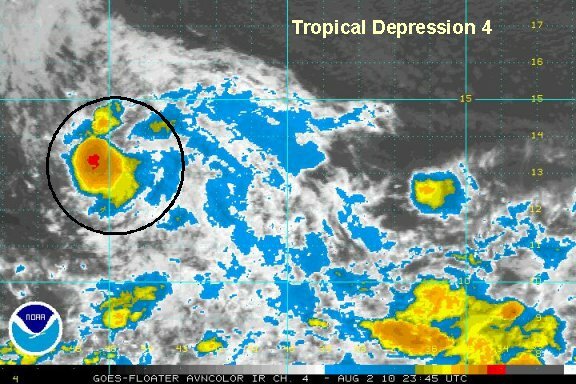 Our estimation is that this low is still on the border of tropical depression status. 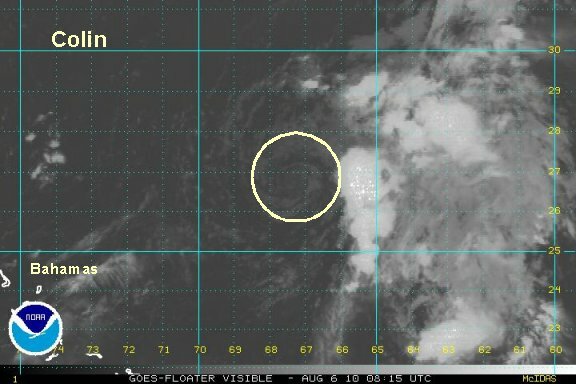 It is interesting to note that another tropical wave several hundred miles east southeast of the tropical disturbance has deeper convection than the disturbance itself. As of 8am edt / ast the tropical disturbance was centered near 12.5 N / 40 W or over 1400 miles east of the Windwards. Movment was west northwest at about 10-15 mph. Forecast models take have definitely shifted the track northeastward over the past few days. The general track takes the low about 100 miles northeast of the Leewards in about 3 days then east of the Bahamas and offshore of the U.S. in about 7-8 days. As mentioned yesterday, forecast models can have a high range of error especially several days out. Interests in the northeastern Caribbean, Bahamas, Bermuda, and eastern U.S. should follow this disturbance. NHC officially classified the tropical disturbance a short while ago as a westerly wind was found on the ASCAT. We had previously mentioned that a west wind was also found on a ship report indicating a closed low. Tropical depression 4 will strengthen some, then face some wind shear, limiting its development in a few days. 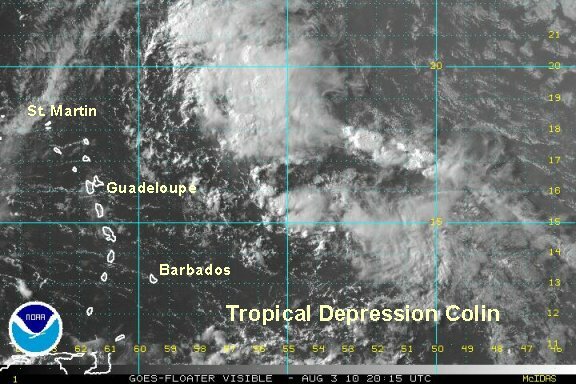 As of 2 pm edt / ast tropical depression 4 was centered near 12.7° N / 40.1° W or about 1350 miles east of the Windwards. Movment was west northwest at about 17 mph. 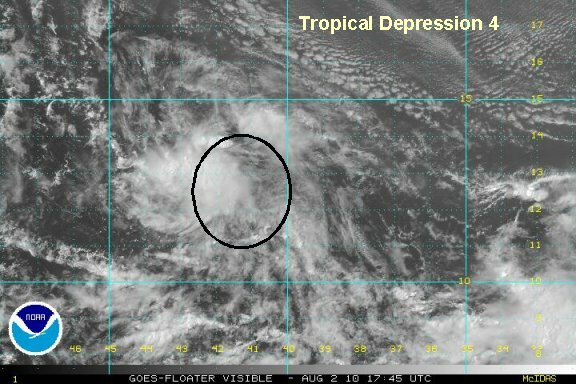 Tropical depression 4 has changed little today. The convection is rather skimpy. Easterly wind shear has ripped convection from the center of circulation. 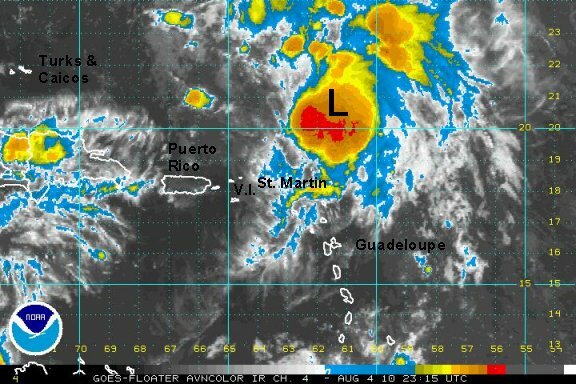 As of 9 pm edt / ast tropical depression 4 was centered near 13.0° N / 44.0° W or about 1100 miles east of the Windwards. Movment was west northwest at about 20 mph. Top sustained winds 30 mph (NHC 35 mph). Forecast models take have still shifted the track northeastward over the past few days. The general track takes the low about 100-200 miles northeast of the Leewards in about 2 days then east of the Bahamas and offshore of the U.S. to near Bermuda. As mentioned yesterday, forecast models can have a high range of error especially several days out. 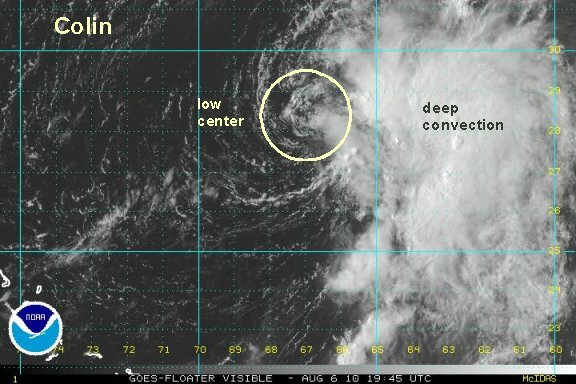 In agreement with NHC, convection with tropical depression 4 has built closer to the center of circulation and the structure has become more organized. Because of this, Colin has been upgraded to tropical storm strength. A buoy has measured a wind gust of about 35 mph and seas up to almost 10 feet not to far from colin. We think that Colin's tropical storm winds are not very expansive yet. After studying visible satellite imagery, we are estimating Colin a little farther south than NHC. As of 7 am edt / ast tropical storm Colin was centered near 13.7° N / 47.5° W or about 900 miles east of the Lesser Antilles. Movment was west northwest at about 23 mph. Top sustained winds 40 mph (NHC 40 mph). Pressure 1006 mb. The forecast track takes Colin low about 100-200 miles northeast of the Leewards in about 1 1/2 days then east of the Bahamas and offshore of the U.S. to near Bermuda. As mentioned yesterday, forecast models can have a high range of error especially several days out. Interests in the northeastern Caribbean, Bahamas, Bermuda, and eastern U.S. should follow Colin. 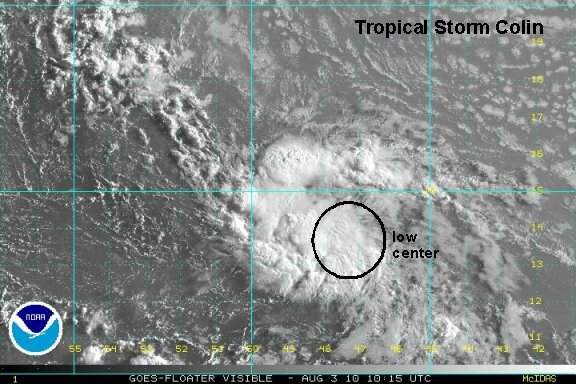 After studying the visible satellite imagery it looks like the low level center is actually farther north than either NHC or we thought. In fact a well defined low level circulation was briefly apparent on the northwest side of the convection before being clouded over again. Another well defined spin is farther southeast and must be more of a mid level circulation. Once again giving testimony of how badly we miss the Quickscat satellite! The Quickscat imagery helped us tremendously in determining where the low level center was located when it was not clear on satellite imagery. Colin continues to fight wind shear and is fighting for its life right now. It is difficult for a tropical cyclone to develop when it is moving this fast. At this time Colin is predicted to stay on this quick pace around the Bermuda-Azores high. As of 2 pm edt / ast tropical storm Colin was centered near 15° N / 52° W or about 600 miles east of Martinique. Movment was west northwest at about 23 mph. Top sustained winds 40 mph (NHC 40 mph). Pressure 1006 mb. The forecast track takes Colin about 50-100 miles northeast of the Leewards in about a day then east of the Bahamas and offshore of the U.S. to near Bermuda. With colin staying weak it is being steered farther west with the low level flow. This will take it closer to the Leewards - as the forecasts predicted several days ago! As mentioned yesterday, forecast models can have a high range of error especially several days out. As per our previous update Colin has been struggling. NHC concurred with that assessment and now has said that it has degenerated into a remnant low. It was moving as fast as you will see a weak tropical system move. The forward motion was too much for it to build convection. It is interesting to note that as we mentioned earlier, it looked like this system formed out of the monsoon trough. In the Atlantic basin the vast majority of tropical cyclones form from tropical waves. Others form from upper lows or along fronts. 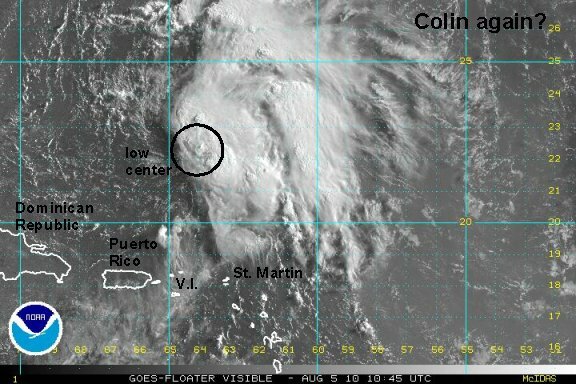 As of 5 pm edt / ast the remnants of Colin were centered near 15.8° N / 53.8° W or about 540 miles east of the Leewards. Movment was west northwest at about 35 mph. Top sustained winds 40 mph (NHC 40 mph). Pressure 1006 mb. The top sustained winds are from forward motion alone and not from a closed low. The forecast track takes the remnants of Colin about 50-100 miles northeast of the Leewards in about a day then east of the Bahamas and offshore of the U.S. to near Bermuda. With colin staying weak it is being steered farther west with the low level flow. This will take it closer to the Leewards - as the forecasts predicted several days ago! As mentioned yesterday, forecast models can have a high range of error especially several days out. Interests in the northeastern Caribbean, Bahamas, Bermuda, and eastern U.S. should continue to follow the remnants of Colin. This will be the last update unless regeneration occurs. Yesterday the low that was associated with tropical storm Colin became elongated and eventually weakened into a trough. The remnants of the surface low looked to move north of Puerto Rico today as it continued to dissipate. A mid level low more recently near the deep convection seems to have developed a new surface low. The low is on the northern edge of the convection. The windshear from the upper low to the west must be weakening since deep convection has now built over the low. 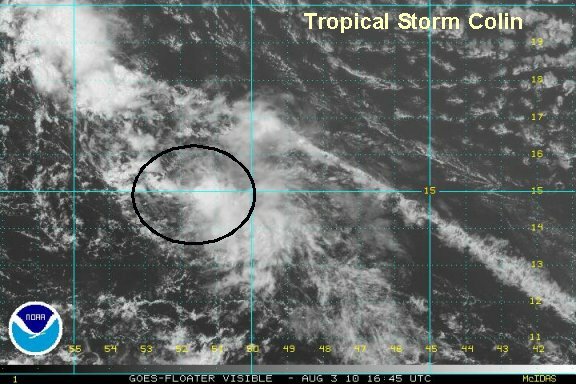 If the convection can hold on, we will see a resurrection of Colin - or if NHC decides that this is a totally new system - eventually Danielle. As of 8 pm edt / ast the tropical disturbance was centered near 20.7° N / 61.5° W or about 210 miles northeast of St. Martin / St. Maarten. Movment was northwest at about 15 mph. Top sustained winds are estimated at 30 mph. Forecasts take this system to the west or near Bermuda in about three days. Interests in Bermuda should continue to follow this system. NHC continues to up its probability of reinstating Colin, but seem to be waiting for the recon later today to make sure. It will like go straight back to tropical storm strength and skip the tropical depression stage. Will it be Colin or Danielle? Depends on how NHC treats what happened to the surface low of Colin....hard to guess. It appears to us on the visisble satellite imagery that a surface low has formed enough to reclassify. An upper air trough is still west of the system keeping the low center close to the edge of the convection. As of 8 am edt / ast the tropical disturbance was centered near 20.7° N / 61.5° W or about 275 miles north northeast of the Virgin Islands. Movment was northwest at about 15 mph. Top sustained winds are estimated at 35 mph. Forecasts take this system to the west or near Bermuda in a few days. Interests in Bermuda should continue to follow this system. A well defined surface low is on the edge of the deep convection fighting windshear from a trough to the west. A recon has found flight level winds of over 50 mph. No doubt NHC will reclassify at 5 pm edt. Will it be Danielle or Colin? We'll soon see! As of 4 pm edt / ast the tropical disturbance was centered near 24.8° N / 65.8° W or about 525 miles south of Bermuda. Movment was north northwest at about 16 mph. Top sustained winds are estimated at 50 mph. Forecasts take this system to the west or near Bermuda in about 1 1/2 days. Interests in Bermuda should continue to follow this system. It looks like colin's brief stint as a tropical storm is over - again. 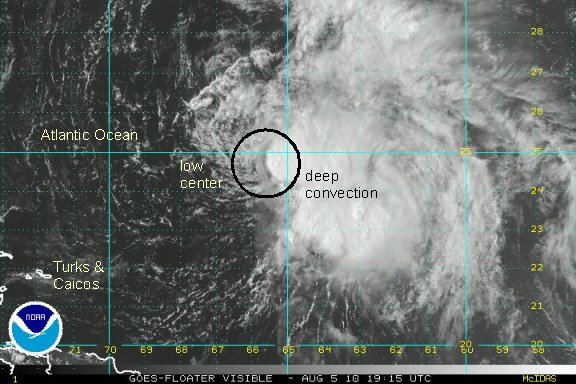 Upper air winds have totally stripped the deep convection well to the east of the circulation center. NHC's 45 mph appears to be very generous. There probably are some gusts to about 40 or maybe 45 mph with the thunderstorms to the east. As of 7 am edt / ast the tropical storm Colin was centered near 27.0° N / 67.4° W or about 400 miles south southwest of Bermuda. Movment was north northwest at about 14 mph. Top sustained winds are estimated at 35 mph (NHC 45 mph). Pressure 1008 mb. Forecasts take this system to the west or near Bermuda in about a day. Interests in Bermuda should continue to follow this system. Tropical storm Colin is falling apart in the true sense of the definition. The low level center started moving northeast today, then recently nearly stopped. It being elongated as strong upper air winds from the southwest tear at its structure. No doubt in the deep convection to the east that tropical storm force winds still exist. It Doesn't matter if it is classified as a storm for Bermuda....wind and rain will move across the Island over the next 36 hours. As of 4 pm edt / ast the tropical storm Colin was centered near 28.2° N / 66.9° W or about 315 miles southwest of Bermuda. Movment was erratic, but will move north shortly at about 10 mph. Top sustained winds are estimated at 35 mph (NHC 45 mph). Pressure 1008 mb. Forecasts take this system to the west or near Bermuda by Saturday afternoon. Interests in Bermuda should continue to follow this system. Later last evening and through the night, wind shear has eased some. This rescued Colin from demise. A large burst of deep convection has reappeared on the southeast side of the circulation. Bermuda is on experiencing a steady south southeast wind of 20 mph. Radar shows one band of rain moving through the island with the bulk of heavy showers and storms remaining well south. As of 7 am edt / ast the tropical storm Colin was centered near 30.4° N / 66.0° W or about 160 miles south southwest of Bermuda. Movment is north at about 10 mph. Top sustained winds are estimated at 40 mph (NHC 45 mph) in the deep convection. Pressure 1009 mb. Forecasts take this system to the west or near Bermuda by Saturday afternoon / evening. Interests in Bermuda should continue to follow this system. The most recent visible satellite images show that shear has increased again. It has exposed the low center which looks disrupted. Colin continues to have a hard time surviving and it is likely no longer a tropical storm - again.